When I became a Christian I had no Idea about how to face the giants in my life, at least not from a Godly perspective. I think I looked at it pretty much as challenges come and you just have to tough it out, or party through it. Now as I am a Christian, facing giants has a whole new meaning. The kind of giants I am talking about are things like finding out you have a terminal illness, someone very close to you has just passed away, you lost your job and are now loosing your house, you were abused as a child and you are dealing with the anxiety of facing the internal issue and seeking healing. There are so many more. When I first got saved I truly hated myself and facing that giant was very difficult. 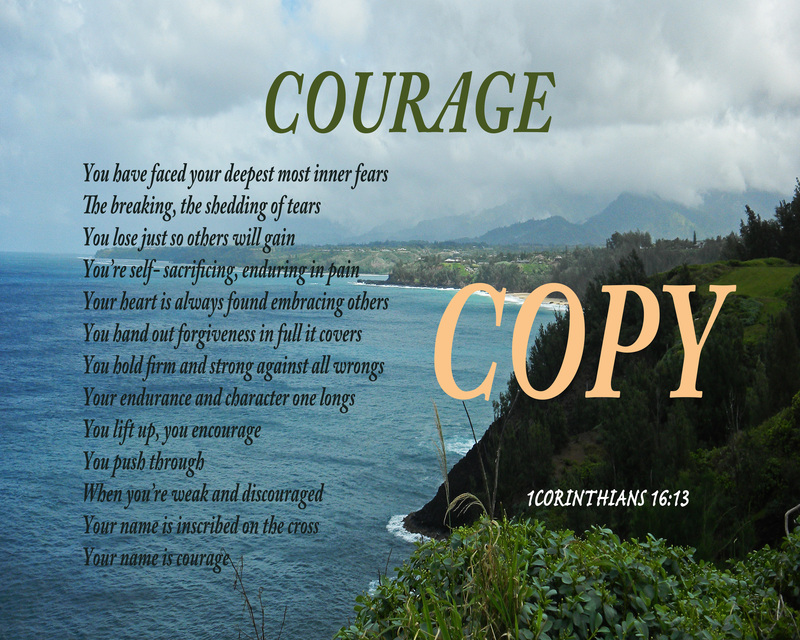 Getting to the heart of the giant takes courage, faith and God. I had so much fear in my heart and I didn’t believe in myself. I grew up bullied by other kids, when I was younger I was very small and skinny. It wasn’t until I turned sixteen yrs old that I sprouted and those problems ended. Even though they ended I still deal with some of those emotional issues from back then. What I can tell you is even though I still have some emotional issues and fears, I will take on the giants that come. I have learned as David did with the lion and bear. God is faithful and full of joy when we put on faith believing in Him and His word. Lets look at Davids heart in facing Goliath. Notice Saul, doesn’t he sound like the whispers of satin? “You are not able” Isn’t that just like our enemy filling our heads with fear and doubt! If I could count how many times I have heard those thoughts “you are not able”. This is where truth comes in. Listen to David “when a lion or a bear came and carried off a sheep from the flock, 35 I went after it, struck it and rescued the sheep from its mouth. When it turned on me, I seized it by its hair, struck it and killed it. 36 Your servant has killed both the lion and the bear; this uncircumcised Philistine will be like one of them, because he has defied the armies of the living God”. If you have conquered a giant before, you can do it again! As David defeated a lion and a bear, he knew if God helped him then, He will do it again! If you haven’t faced your giant yet, then you need to trust God and walk through it trusting Him. Once you have defeated a lion with God you will be ready to take on Goliath! Whatever giants you face you can trust God, you can take hold of His truth, you can put on the faith to be victorious in whatever you face in this life. David didn’t wait for the giant to come to him, he went to the giant, with God at his side. God bless you and may your faith move mountains by overcoming the giants in your life. God bless you and keep you victorious. 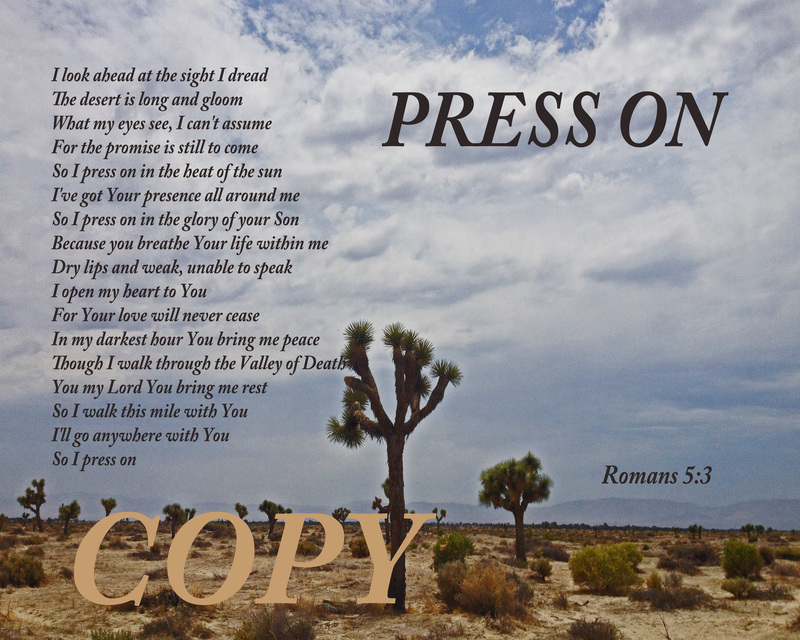 Press on! I’m sure you can imagine what I was going through when I wrote this poem. I could actually write a sequel to It this very moment. 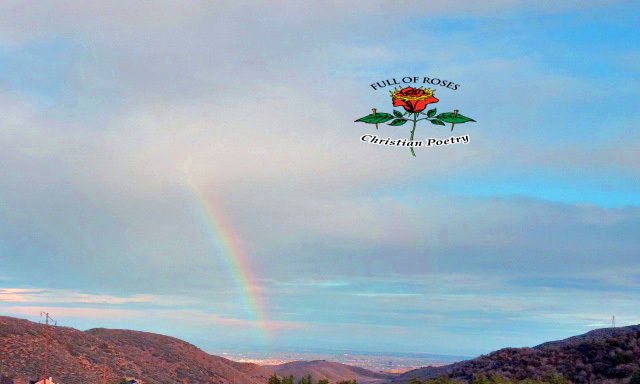 I want to encourage you and if you haven’t read my post Rainbow Symbolism Of Promise I encourage you to do so. I am going to expand on that post in this post because I believe it was a powerful revelation to our walks with God. 5 [L Therefore,] Since we have been ·made right with God [declared righteous; justified] by our faith, we have[a] peace with God. This happened through our Lord Jesus Christ, 2 ·who through our faith[b] has brought us into that blessing of [L through whom we have access by faith to] God’s grace ·that we now enjoy [L in which we stand/live]. 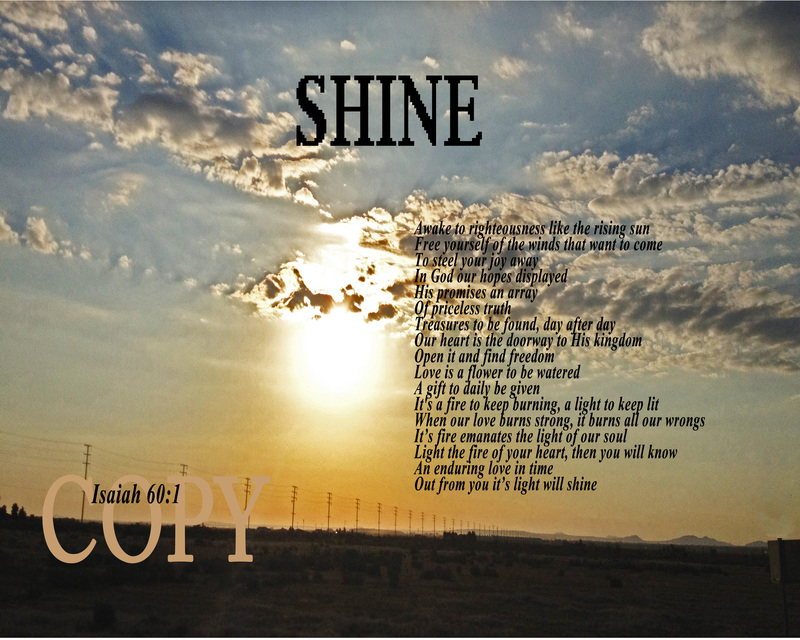 And we ·are happy [rejoice; boast] because of the hope we have ·of sharing [or of experiencing; L of] God’s glory. 3 [L Not only this, but] We also ·have joy [rejoice; boast] ·with our troubles [through suffering/trials/persecution], because we know that ·these troubles [suffering; trials; persecution] produce ·patience [endurance]. 4 And ·patience [endurance] produces [tested and proven] character, and [tested and proven] character produces hope. 5 And this hope will never ·disappoint us [let us down; or put us to shame; dishonor us; C honor and shame were among the most important values in first century culture], because God has ·poured out his love to fill our hearts [or flooded our hearts with his love]. He gave us his love through the Holy Spirit, whom God has given to us. 6 [L For] When we were ·unable to help ourselves [L still helpless/weak], at the ·right [or appointed] time, Christ died for ·us sinners [L the ungodly/wicked]. 7 ·Very few people will [or Rarely/Scarcely will anyone] die for a ·righteous [just; pious] person. Although perhaps for a ·good [truly good; noble] person someone might possibly die [C the “righteous” person may be someone who is outwardly religious, while the “good” person is genuinely generous and loving]. 8 But God ·shows [demonstrates; proves] his ·great [L own] love for us in this way: Christ died for us while we were still sinners. 9 And since we have now been ·made right with God [declared righteous; justified] by ·the blood of Christ’s death [L his blood], ·we will surely also [L how much more shall we…!] be saved through Christ from ·God’s anger [final punishment; L the wrath]. 10 [L For if] While we were God’s enemies, ·he made us his friends [L we were reconciled to God] through the death of his Son. ·Surely [L How much more…? ], ·now that we are his friends [L having been reconciled], he will save us through his Son’s life. 11 And not only that, but now we ·are also very happy [also rejoice/boast] in God through our Lord Jesus Christ. Through him we ·are now God’s friends again [have now received reconciliation]. As we go through many trials in our walks especially the testing of our faith which is the trials I am addressing. We must understand we have been set apart for Gods purpose. As I described In my last post Gods presence is upon us like a cloud. In our hearts He is like a consuming fire, glowing metal, a rainbow in the clouds. His spirit is constantly working to burn out our sinful nature making room for His spirit which is the rainbow in the clouds. We are ashes presented to God daily, which He receives and replaces with His beauty. Beauty for ashes! We should have a heart of conviction and if you do, that is His inner work that takes place from reading His word and encountering His truth. His truth becomes the consuming fire within us, casting out self-righteousness and living in conviction. We no longer judge others or try to remove the speck out of the eyes of others instead we remove the plank from our own eyes. If we are not having this experience we should be seeking God deeply for His spirit of truth. When we live in self-righteousness we will think more highly of ourselves and hold strict judgement towards others which places judgement from God on our sin and pushes out the grace God has poured out on us. So the trails are producing change through pressure that is strengthening us for what is ahead. The longer we resist the change God is calling us to, the longer we will struggle in the current trial if the trial is for the testing of our faith. Sometimes we run from the trial which is only to find us face to face with a similar trial aimed to produce the heart surgery God scheduled. We are called to press on in our trials because they have a purpose producing perseverance. Tested proven character which produces hope and this hope will never disappoint us. Through Christ we are now friends with God. So don’t seem it strange that you are going through theses trials, your brothers and sisters are experiencing the same kind of trials. The question has come up do I believe God is causing these trials? Trials come by many reasons, some we bring on ourselves. Some are attacks from the enemy satin, some by God for the testing of our faith and some by tragedy, regardless where they come from we have the promise that God will take our weakness and turn it to strength so don’t lose hope or live in hopelessness Christ is with us. God knows your deepest need and He is with you. I am addressing mostly in this post the testing of our faith. brothers and sisters I am so blessed we can join hands in our trials. Inspire and encourage one another. As Iron sharpens Iron, and one man sharpens another. Bless you In the name of Christ, I pray you are strengthened and moved to press on in hope. May Christ bless your heart! Everyday is a new day, some clearer than others. There are days of a clear focus, full of Gods spirit. Days when you feel you have one foot in heaven. There are days heaven feels a thousand miles away. Days where tears are stored in a bottle and lonely hearts go faint. When hope is differed and questions seem to go unanswered. Trials seem to never end, may it be the wilderness before your public appearance, or the valley of death training the Jedi Knight. We all know what it means to grow in the Lord. Your beginning in Christ found at the end of addiction or addiction found its way in after years of serving. Thinking it is impossible to fall from the strength you have in Christ, only finding yourself beginning again. The hope we have calls us to rise up in every situation leading us all to one place. The foot of the cross worshiping Him. 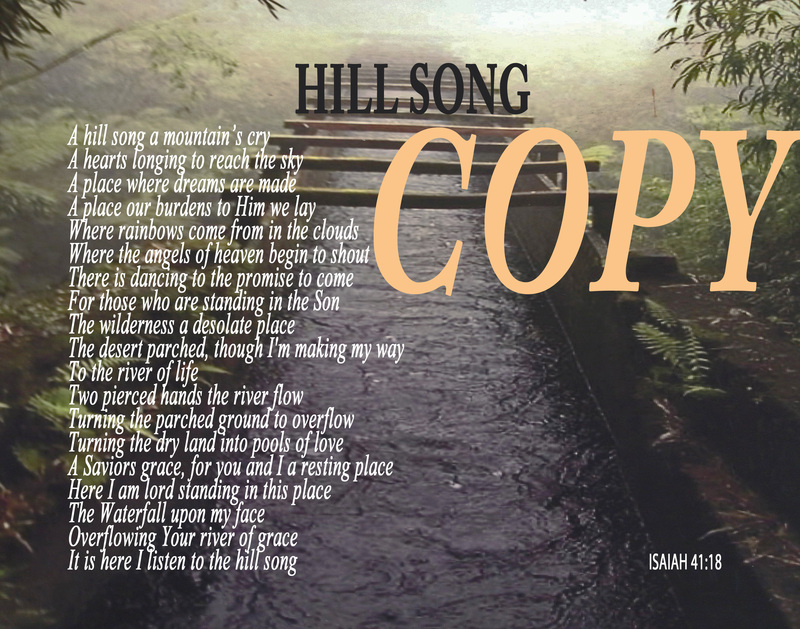 Hill Song is where the river flows. Where we follow the river of God. Where we worship and find ourselves at the foot of Jesus. The place our true lives are found. Where healing and freedom takes place. The place of promise we climb to. The river of truth, living water. Things are never what they seem. God is in control and always working to lead us into His everlasting peace and joy. Stay strong, follow the river of His presence. Remain in prayer and encourage one another. Be the shoulder to cry on, the smile that strengthens the one in need. Be His hands and feet along the river’s edge. You never know when it will be you in need. Join hands as we follow the river of God. May your day be full of encouragement. May your heart overflow of His goodness as you walk towards the river of life. God bless you.